Here you can clearly see some of the many changes which have taken place over the last 15 months. The Passionfruit has gone. Planted in 2002, it finally succumbed to a combination of age, heat, roadworks, and being in a vulnerable position. 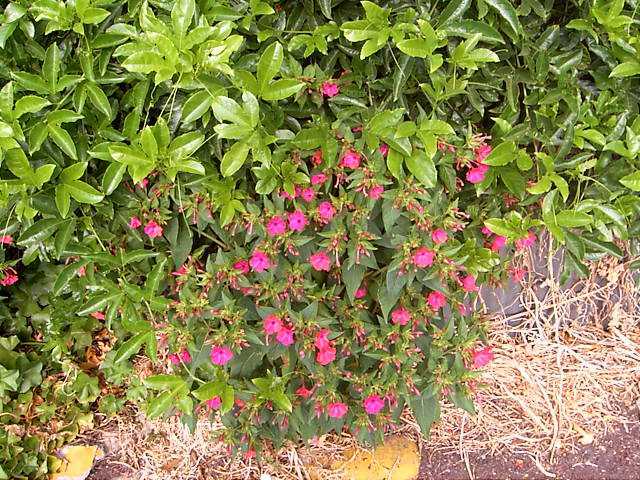 I have replaced it with 2 bouganvilleas, which are much more heat & drought resistant, and less vulnerable to damage. While they are growing, I planted a few pumpkins to fill part of the gap. The huge gap by the Stobie pole is where the gas fitters dug a trench to renew piping. It's taking time to cover, since it was backfilled with gravel, & is constantly subjected to exhaust fumes from cars backing out of the driveway across the lane. But the Bouganvillea will eventually cover most of the fence, & with patience the cuttings of Pelagonium & Sweet Potato I'm nursing in the gap will cover the ground. The yellow container is filled with wet sand, to act as a warning, & a buffer, in an effort to protect the Stobie pole & corner of the fence from traffic. 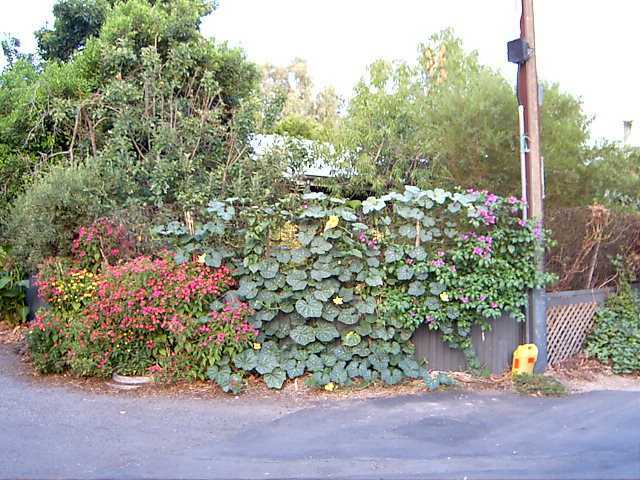 The entire fence is on the boundary between narrow access lanes & the garden. It is protected from damage only by my brave plants, which also disguise the many dents & worse which have occurred in spite of their presence. The Mirabilis, or 4 o'clocks, have done a particularly brilliant job this year, in spite of frequent damage because they are positioned right on the corner. The mulch, by the way, is not pea-straw, but nasturtium straw, left behind each year by the winter crop.This year's seedlings are already appearing in a few sheltered spots. The harvest continues, in spite of some damage unwittingly caused by abundant wildlife. There was a good crop of Beauty of Bath apples, repaying the effort of 'wrapping' them against sunburn, birds & possums, & the Sultana vine cropped well. The Lisbon lemon still lives up to its reputation, supplying lemons all year round. I had a good garlic crop. I've made fig jam & fruit sauce, and am still picking figs. There are 7-year beans, radishes, pumpkins, zucchini, a variety of herbs & lots of greens. The Guava & Macadamia have just started dropping some of their fruit, & will continue to do so throughout the Autumn & Winter. & the possums have left just a few Persimmons on the lower branches. The Jerusalem Artichokes are growing strongly, so should provide a good crop, but the Sweet Potatos have not made their usual luxuriant top growth, due to my new watering regime, so how many tubers are being formed remains to be seen. This watering system has reduced the amount of mains water used on the garden this summer by almost 2/3rds, so has been well worth the extra effort. Over the last 15 months I almost despaired of my vision for the garden. I was ill for much of the hottest & driest year on record. Drought & wildlife caused enormous damage, & I was unable to water effectively, or to properly deal with the crops that did survive in the garden. But the last few weeks have truly reminded me that, if we are patient, nature does indeed restore health & balance to all life. The vision was always of Sanctuary & sufficiency, rather than superfluity. This is a corner of the same place, taken in January 2005, before the big drought. or 0° of Celestial Longitude, this year at 17.33 GMT on 20th.March. & warmth of spring, and the lengthening of daylight. Which means that it applies only in Northern latitudes. of Autumn, & long for rain, & the end of daylight saving! The theme of either Equinox is balance and unity. the 12-hour night in the South being balanced by the 12-hour day in the North. those of you in the North begin to travel towards Summer. yours creative and joyful Beltane.